To marinate steak: Combine 1 tablespoon sugar, paprika, cumin, granulated garlic, pepper and 1 teaspoon salt in a small bowl. Rub the mixture all over both sides of steak. Refrigerate, uncovered, for 1 day. To prepare relish: Combine cucumbers and ¾ teaspoon salt in a medium bowl. Let stand for 30 minutes. Stir in scallions, mint, parsley, garlic, oregano, sugar, crushed red pepper, ⅓ cup oil, vinegar and lemon juice. Let marinate at room temperature for 1 hour more. Brush the steak with 2 tablespoons oil. Toss tomatoes with the remaining 1 tablespoon oil, garlic, thyme and the remaining ¼ teaspoon salt. Grill the steak 4 to 5 minutes per side for medium-rare. Grill the tomatoes, cut-side down (without turning), until softened and lightly marked, 3 to 4 minutes. Let the steak rest for 10 minutes; thinly slice against the grain (see Tip). 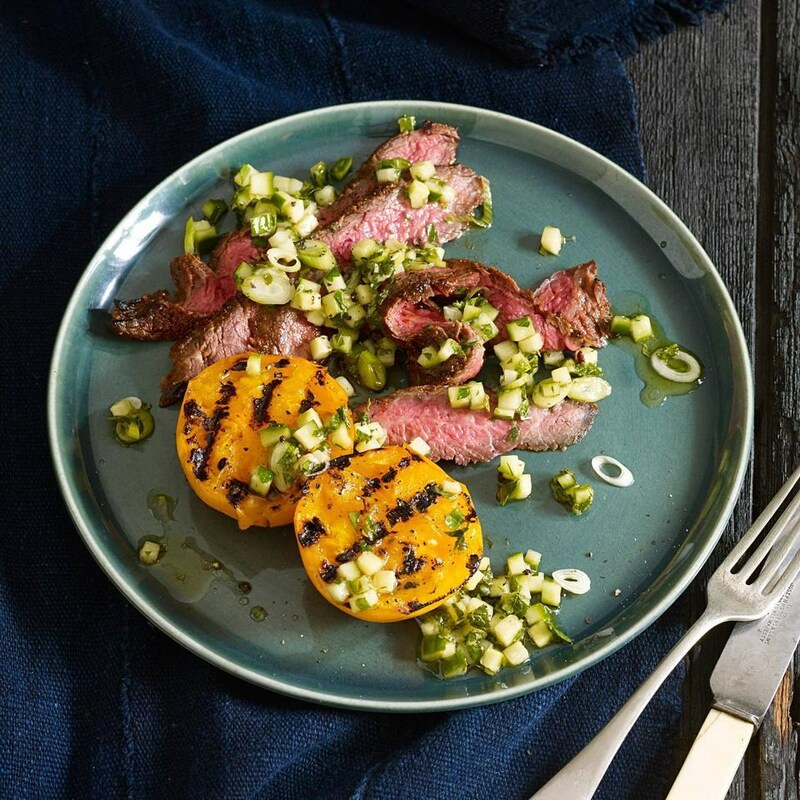 Serve the steak and tomatoes with the cucumber herb relish. For tender sliced steak, particularly from tougher cuts like skirt and flank steak, thinly slice it crosswise against (or “across”) the grain. The grain is literally muscle fibers and looks like long, thin grooves in the meat.